Footings are the ultimate link between your covered patio structure and the earth; they support the patio's frame and transfer structural loads to the ground. Conventional patio covers use one of the most basic types of footings, called a spot footing. Spot footings are solid blocks or cylinders of concrete that extend below grade and protrude above grade. Tubular concrete forms offer an easy way to accurately size and construct your footing. Consult your local building department to determine footing width and depth requirements; your area might have special regulations, such as extra deep footings to prevent frost heave. Dig a hole roughly 24 inches in diameter. If you're using a smaller tube form, dig the hole twice the diameter of the form. Dig the hole to a depth 6 inches below the desired position of the form's bottom. For example, if your footing depth requirement is 12 inches, dig the hole 18 inches deep. Use the shovel to fill the bottom 6 inches of the hole with gravel. Cut the form to length with a utility knife, including a 6-inch extension above grade. For example, add 6 inches to a footing that extends 12 inches below ground to achieve an overall length of 18 inches. Place the tube into the hole so it is vertical and centered in the space. Place a level across the top of the tube and and down the side, to be sure it is level and plumb (the vertical orientation). Fill the space between the the outside of the tube and the sides of the hole with gravel. Intermittently tamp the gravel with your shovel. Fill the space with gravel to ground level. Use a rebar cutter to cut two pieces of number 4 rebar to a length equal to the depth of the hole plus 6 inches. Plunge the rebar into the center of the tube and through the underlying gravel. Position the rods evenly spaced near the center of the form. Push the rods into the ground until their top ends sit several inches below the form's top edge. Mix two 60-pound bags of concrete in a wheelbarrow with a shovel. 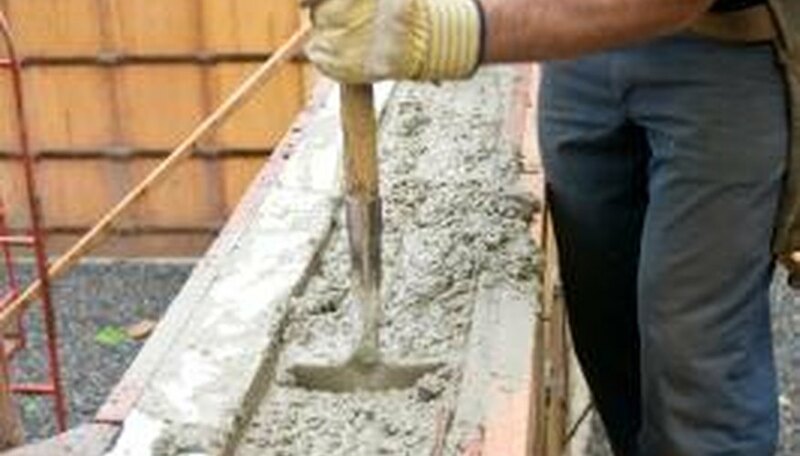 Tip the wheelbarrow to pour the concrete into the form or scoop the concrete into the form with the shovel. Fill the form until the concrete is flush with the form's top edge. Repeatedly plunge a spare piece of rebar in and out of the wet concrete to encourage settling and remove air pockets. Draw a scrap piece of 2-by-4 across the form's top to screed the concrete; select a straight piece for best results. Add more concrete mix to the form or strike off any excess if necessary.